During the Olympic Break the Devils were looking at a schedule that would throw them right back into critical action. The Devils first game coming off the Olympic Break would come against a divisional foe that sat 2 points ahead of them in the standings. The Devils came into tonight’s game against Columbus losing all three of the previous meetings. With added emphasis on their offense, and specifically on the power play, the Devils called up a familiar face from Albany, Eric Gelinas. New Jersey was 0 for 13 on the power play after sending Gelinas down to Albany and were hoping to get a spark on the power play with his return. In the first period, New Jersey came out with a noticeable jump. Both teams came out with energy and both goalies, as expected, came out a bit rusty. With the extra energy the Devils took the lead at 6:09 of the first on Ryane Clowe’s 4th goal of the season, from Andrei Loktionov. Forty-five seconds later New Jersey found themselves with the man advantage after Wisniewski was called for interference. Thirty-seven seconds later Jagr scored his 699th career goal and his 18th of the season from Gelinas and Elias, on the power play. The Jagr goal was the Devils first power play goal since January 30th in Dallas, a four game drought. The Devils took advantage of another power play at 8:54 of the first when Adam Henrique netted his 15th goal of the year from Greene and Merrill. After making a note of being more aggressive on offense the Devils came out and scored 3 goals in 2 minutes and 45 seconds. At 11:36 Artem Anisimov brought the Blue Jackets back within 2 on a sharp angle shot that got past Cory Schneider for his 14th goal of the year from Jack Johnson. In the second period, Columbus came out and took the momentum away from the Devils and cut the lead to just one at 11:42 of the second. Marian Gaborik was left alone at the front of the net and scored his 6th of the year from Anisimov and Foligno. After what seemed to be an uneventful period for the Devils and being shorthanded with just 34 seconds left in the 2nd period, Patrik Elias took advantage of a misplayed puck and sent Adam Henrique on a breakaway that resulted in Henrique’s second goal of the game and his 16th of the year at 19:41 of the second. That goal extended the Devils’ lead back to 2 and swung momentum back New Jersey’s way before the final period would even begin. New Jersey, continuing the trend they’ve had all season, came out and upped the pressure and their energy in the third period. The Devils did not seem satisfied sitting on their 2 goal lead and seemed to be looking for more. They did not find more until 19:24 of the third when Patrik Elias broke out on a 2 on 1 with Adam Henrique. Elias tried to pass to Henrique to help him score his first career hat trick; the pass deflected off a defenseman and into the empty net to solidify the Devils 5-2 victory. 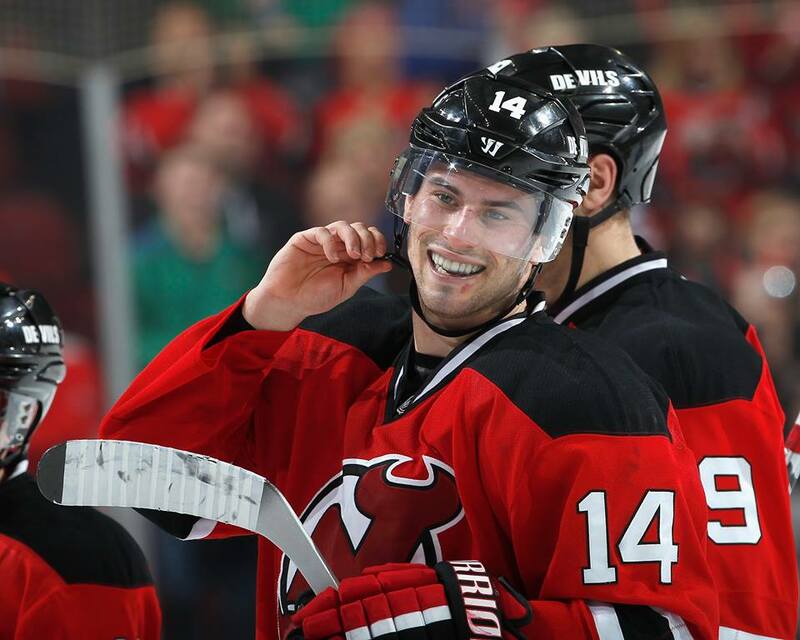 The Devils will make the trip to Long Island on Saturday to meet another division rival, the Islanders. Coach Peter Deboer has already committed to starting Marty Brodeur on Saturday. Coach Deboer did not give any information regarding injured players Bryce Salvador and Damien Brunner, and does not know if they will be available Saturday.